Never miss a beat and keep your business in compliance 365 days a year through 2019. Labor Law Updates can happen multiple times per year and require mandatory updates to posters. We'll immediately ship you new posters for no additional charge every time a mandatory update takes place, without any limits. Sign up for $62.99 per year and receive Free Shipping. Save time, the risk of non-compliance (which can lead to fines), & money with this option! Order one for each CA office and location to be fully compliant. The 2019 All-In-One Labor Law Poster will include the following state & federal requiredposters for all businesses into one laminated 25.5" x 39.5" poster. OSHA and CalOSHA Posters are included on the California Complete Labor Law Poster. When you order the California Complete Labor Law Poster, it will satisfy your State, Federal, and OSHA posting requirements with one poster. 11/2018 - Family Care and Medical Leave and Pregnancy Disability Leave - Notice redesigned with information about the New Parent Leave Act effective April 1st, 2019. 11/2018 - Minimum Wage Poster - Revised to add 2019 and 2020 minimum wages as well as allowances for room and board under the minimum wage tab. 11/2018 - Discrimination - Updated with new harassment training requirements for employers. 06/2018 - Unemployment Insurance Poster - Extensive change to the notice to clarify who is able to receive unemployment insurance benefits, disability insurance benefits and paid family leave as well as how to file a claim. 06/2018 - EDD Notice to Employees - Revision to simplify the language on how to file an unemployment claim as well as who qualifies for unemployment insurance benefits. 06/2018 - Transgender Rights in the Workplace - Updated to include revised language on employer’s obligations when it comes to providing adequate restroom, shower, and locker room facilities for transgender individuals. 06/2018 - Discrimination - Updated to adjust a few words for clarification and added a new revision date. 11/2017 - OSHA - Updated to reflect reclarification of code citations. In addition, the penalty information has been revised along with other revisions to agency information. 11/2017 - Transgender Rights in the Workplace - New posting requirement for the state of California effective January 1, 2018. 12/2016 - Minimum Wage Poster - Updated to reflect new 2017 minimum wage rates, effective January 1, 2017. $10.50 for employers with 26 or more employees and $10.00 for employers with 25 or fewer employers. 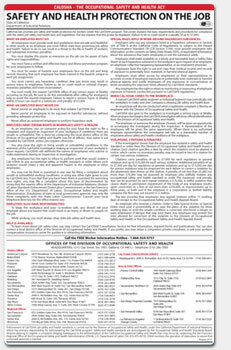 04/2016 - Your Rights and Obligations as a Pregnant Employee - Brand New pregnancy rights and obligations poster that consolidates previous versions known as "Notice A & B". 05/2016 - Time Off to Vote Notice - Update to "Time off to Vote" poster, changes includes new info on time off voting rights and new layout changes to poster. 07/2016 - Fair Labor Standards Act (FLSA) - Update includes new regulation revisions as of August 2016 which includes text regarding nursing mothers and overtime rules. 07/2016 - Employee Polygraph Notice - Update includes new regulation revisions as of August 2016 which includes the removal of penalty amount up to $10,000 against violators and revised contact numbers. 05/2015 - OSHA - Updated to reflect an employee's right to report work-related injuries and illnesses free from retaliation. 05/2016 - Employee Polygraph Notice - Minor update includes a new QR code and contact information. 05/2016 - Family and Medical Leave Act (FMLA) - Update includes minor reformatting and slight changes of verbiage regarding the usage of FMLA. Many industries such as the restaurant, retail, construction, and professional use the California Complete Labor Law Poster to satisfy their compliance requirements for State, Federal, and OSHA. When posted in an area frequented by employees, the California Complete Labor Law Poster puts a business in full compliance. Are You a Federal Contractor or Subcontractor? Federal contractors and subcontractors are required to display more postings in addition to the general State, Federal, and OSHA regulations. Please click here to see the federal contractor and subcontractor posting requirements. Ensure your full compliance by posting the California Complete Labor Law Posters with the federal contractor-required postings. © LaborLawCenter, Inc. 2019. All Rights Reserved. "The fact that I was contacted personally by a representative and was able to replicate the previus year's order and shipping information rather than having to re-enter everything was very helpful and helped to ensure that we continued using your service this year. It is a busy time of year & while it was on the "to-do" list it wasn't a top priority so the efficiency was appreciated." "Appreciate your staff and thier willingness to look into various inquiries and questions (i.e. ability to think outside the box) to find a win win solution for customer and your company." "I like the ease of ordering (online or via phone). I also like the flexibility. I deal with multiple states. When I have needed to return a poster. you have taken it back with no problem." We understand that complying with all the laws and regulations that affect your company is challenging, expensive and time consuming. In a given year hundreds of labor law posting changes can occur that will impact your compliance. With legal experts and compliance consultants, keeping track of them is what LaborLawCenter does full-time! Here at LaborLawCenter our Compliance Experts are constantly working to stay on top of the many compliance changes so you don’t have to. Our mission is to be your solution for the easiest and most effective way to stay on top of continual changes in the law. Our company core is researching and developing products and services that make compliance easy for any business type and size. Let us do what we have been doing best for 16 years so you can focus on growing your business without worrying about legal troubles and fines. #1 compliance support in the industry. We know the challenges you face to run a successful business. The tight deadlines, the constantly changing requirements, and the struggle to be better than the competition – we understand. As our valuable customer, you get something nobody else will give you – customer support that cares. Our representatives are dedicated to making your experience as hassle-free as possible. Whether you have fallen behind on compliance requirements, opened a new branch office, or acquired a company in an unfamiliar industry, our support people will be there for you. Last-minute requests, additional orders, returns, rush delivery, exact and detailed compliance advice – you name it, we will be happy to help. LaborLawCenter’s incredible team of Compliance Specialists is available by phone, email, and live chat. Our Compliance Specialists is available Monday – Friday from 6:00AM – 5:00PM PST. Call our compliance support center at 800-745-9970 (toll free), click the Live Chat icon at the upper left corner of this page, or email customerservice@laborlawcenter.com. Whatever problem or questions you have, you are minutes away from having them solved! Peace of mind knowing that every detail is accounted for. We have been helping businesses resolve their compliance problems since 1999, and know exactly which posters you need, where to put them up, and when to update them. Once your order is in, we handle all the details for you. You don’t need to worry about a thing. Your order ships the same day it is placed (provided it was during the workweek), and arrives within 3-5 business days. Our standard shipping policy is other companies’ express delivery! Hassle-free tracking of compliance changes. Requirements for labor law posters change all the time, and we want you to have an easy option to stay informed about the changes relevant to your company. You can do so by checking for poster changes on our website or by subscribing to our newsletter and get all the latest compliance changes straight in your inbox. Personalized advice and products for your business needs. No two companies are alike – different laws and regulations apply to businesses of certain size, and working in specific industries. If you want to go beyond customized posters, LaborLawCenter will happily provide you with a dedicated compliance representative as an added service. This is a person whose only job will be to look at your business needs and meet them with a unique solution. Someone protecting your interests at all times, digging into the smallest, most obscure details of labor law on your behalf, arranging for every detail in the creation of posters and the fulfillment of your orders. Find out more about custom products and dedicated compliance representatives by emailing corporate@laborlawcenter.com or calling 800-745-9970. Unbeatable 365-day return guarantee. Running a successful business with hundreds of satisfied customers doesn’t happen because we never make mistakes, but because we put you first, from the moment you first reach out to us. As far as we are concerned, your complete satisfaction is the only option. If you aren’t happy with your order at any time within 365 days from the date you receive it, we will happily return, exchange, or replace it for you. We take your compliance needs very seriously, and you can rest assured that we will always honor that commitment. Are My Posters Up To Date? Considering the magnitude of state and federal agencies in existence today, it's no surprise that labor laws are constantly changing. Every year, hundreds of labor law changes occur, so it's critical to understand how new requirements affect your business. At the LaborLawCenter™, we monitor every single labor law change for you, so it's easy for your business to stay in compliance. Wondering if you need a poster update? Simply submit your state and purchase date information using the form to the right to determine your level of compliance. Note: Fields in bold denote required information.